Note: Badagi & guntur both are red chillies. The difference is badagi gives good colour & it is not much spicy. Guntur is very hot like other chillies. Dry roast groundnut & remove the covering. Roast red chilly & curry leaves separately. Lightly dry roast dry coconut & tamarind separately. First coarsely grind roasted gram & groundnut. Keep aside in a mixing bowl. 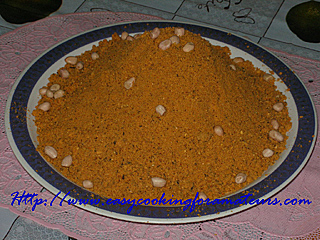 Dry grind salt, red chilly, tamarind, curry leaves, dry coconut & jaggery, add to the groundnut powder bowl & mix well. Once again grind all ingredients for 2rounds to mix it. Groundnut chutney powder is ready to serve. Store it in the tight jar or bottle. You can store it for 6 months. While serving mix it with yogurt or ghee (clarified butter) & serve with chapatti, dosa, idli or rice. Such a delicious chutney powder, thanks for sharing..
Nice chutney powder. looks really good. This is new to me. Must try! i like this chutney with dosas.. tastes good with curd..
Love this simple yet tasty dip, thanks for sharing dear..
wow..chutney powder looks superb..never made it..
Spicy powder and tastes best when served with idli or dosa. Stopping by from SITS! Welcome! Hi Madhura! how are you? @Uma,I am good How r u? Thanks for sharing such a practical and delicious recipe!